This sobering thought is noted in Timber, or Discoveries, the commonplace book Jonson kept until his death so as to collect, record and recollect the insights he thought valuable, as they have flowed out of his daily readings (so the subtitle has it), and wanted to save for future reference. In this way, a commonplace book is both an aid and a repository of memory: it supports our faculty when age or other reasons fail it and keeps a personal treasure house of precious thoughts for further use. The practice was widespread in early modern England and beyond, Francis Bacon even praised it as a good prerequisite to science: there can hardly be anything more useful even for the old and popular sciences, than a sound help for the memory; that is a good and learned Digest of Common Places. Memory, thus, is the basis for all advancement of learning and a matrix of literature. 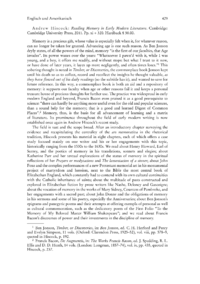 Its prominence throughout the field of early modern writing is now established once again in Andrew Hiscocks recent study.